I care not what some Frank emperor forced the papacy to do (use unleavened bread because he thought it was more "correct" having read about a passover of the jews) the Aramaic clearly says Christ used LEAVENED bread and the gates of hell will not prevail against the apostolic church to use anything other than what the scripture and strong verifiable semitic tradition says. So if protestants want to use unleavened bread to be more like the Jews that's their problem. I know what the scripture teaches the use of leavened bread during the Lordès supper and no deceiver shall argue against me on this. This is a BIG deal, that bread symbolizes his body, that wine his blood. Don't taker another messiah for an answer. Just in case I wasn't clear: the use of unleavened bread for the Lord's supper is an unscriptural protestant practice inherited from the RCC (which probably had it imposed on them by barbarians during thne dark ages), everybody else in the entire world including my church which has much stronger continuity than Protestants uses the leavened bread and the REAL wine (not grape juice) to represent the body and blood of the savior and keep his memory (which Satan wishes to blot out). To use something else is unscriptural and goes against the tradition of the apostolic church and the most ancient readings of the scriptures .Let he who present another gospel be accursed. The End. yes, but the Greek Church video (St. Andrew? Florida? North Carolina?) clearly closed in on the actions of the priest, showing what he was doing, distinctl audio of the prayers (in English), really showing what is going on. Hebrews 7:7 Now beyond all contradiction the lesser is blessed by the better. 8 Here mortal men receive tithes, but there he receives them, of whom it is witnessed that he lives. 17 For He testifies: "You are a priest forever According to the order of Melchizedek." Protestants have no idea what they are messing with here when they try to change the laws and the times on something this critical. They deny the real presence which is held by EVERY apostolic church which was ever founded via laying on of hands, and they EVEN change the composition of the bread (which is now merely "symbolic") to try to force another messiah in their own image. Correct. However he TOOK our sins upon him. In fact, The code name for the Messiah in rabbinic literature (besides "the branch") is "the leprous one" meaning the one who took the sins and illness of the people upon him (unjustly and unmeritedly). That was taken from the official rabbinic interpretation of Isaiah 53 by the way, before someone called Rashi said it never talked about Christ. name me your Bishop (and Jurisdiction). We walk in the way of the Apostles. If the Jews agree that's excellent, if not too bad. As to the metaphorical nature of Paul's use of the phrase, again, the metaphor makes NO SENSE unless the basis is real, or in this case literal. Associations to Passover, keeping the feast, and eating unleavened bread must refer to the literal observance and use of such in order for any extrapolation Paul intends to hold. Else Paul is nonsensical here (as if Roll Eyes). Plain scripture says unleavened Bread. The Aramaic says so. The Greek says so. The tradition of the Apostolic Church says so minus the RCC and Protestants, but this is ONLY because I suspect this sort of anti-scripture bias or the influence of foreign secular powers crept in. No, my bishop saying what the Church says St. Paul is saying is as apostolic as one can get. With all due respect, you telling me that St. Paul says that falls quite short. Luke 13:20-1 And again He said, "To what shall I compare the kingdom of God? "It is like leaven, which a woman took and hid in three pecks of flour until it was all leavened." Rather odd that you are so dogmatic about that, as most Radical Protestants (as in Radical Reformation), hold that observances of feast days were abolished. So you hold that celebrating Easter is required by the NT? That passover has given over to Pascha? As Hebrews shows, the Law has been changed. And what of all the admonitions of St. Paul to "purge out the old leaven that you may be a new lump. For a discussion of Jewish thoughts on leaven in Our Lord's time, Theological Dictionary of the New Testament By Gerhard Kittel, Gerhard Friedrich "The proverbial saying in I C. 5:6=Gl. 5:9" [where it also warns of Judaizing the Gospel] "goes rather beyond the thought and usage of the Jewish festival...here we are a long way from the Passover ordinance." Btw, another twist on the "artos controversy" is the use of "λάγανον" "cake" for unleaven bread (some translations I see now use "wafer"), ex. the Greek of Exodus 29:23. Azymites aren't spoken of as loaves, but cakes. So that loaf we break in I Corinthians is leavened: otherwise we would be breaking cakes. I'm at the Hospital with my wife giving birth to our little baby boy Aidan but she is resting before the 'big moment'. So I was readying some and I want to ask ialmisry... speaking of 'artos'... isn't it fair to admit that even within the Old Testament the Greek word 'artos' is also used for 'unleavened' bread? As I understand, it is so I'm not sure if arguing that 'artos' is only for 'leavened bread' doesn't seem to be as strong? John 6 becomes absolute gibberish if you don't know that He is speaking of the Eucharist. Again, St. John presupposes (and the Church did too: John was not read to catechumens, but only after their baptism, the reason why the Lectionary in Pachal time is from St. John) you know the basic story already. Case in point, Nicodemus coming in the beginning speaks of signs (plural), where the Gospel of John has only narrated that of Cana, a sign that Nicodemos no doubt did not witness. St. John at one point states (3:24) "For John had not yet been thrown into prison," but nowhere does St. John narrate the Forerunner's imprisionment. He assumes you read that already in the Synoptics. Hey!!!! Kudos, Congrats, Mazal Tov, & Blessings! May your quiver be full and your house running over. Thanks! Cleopas! We are hoping for the best! which ones are ancient and which are innovations. And as you point out, it is on the other hand sometimes not hard to discover which parts of modern Jewish belief and practice are innovative. (The question regarding the Masoretic text is a very good example of this.) And as to your point with reference to certain Protestants being very concerned with (modern) Jewish practice, and not with practice in the early and Patristic eras of the Church, I think this is very well taken. A very good expansion of my objections to what I consider to be very errant proof-texting. Nevertheless, Paul still refers to the bread of our feasting as unleavened. The metaphor will NOT work if that bread is indeed leavened. Skirt it all you like, decry the fact that Paul uses it with an abstract application, it will not change the necessity of the bread refereed to by metaphor being unleavened, else Paul makes no valid point, is nonsensical, and obviously is not writing under inspiration of the Spirit of God. Leavened bread just will not do, cause no matter how you twist it, Paul has associated our feasting, our Christ, and unleavened bread in eternal union. After all, God's word is settled forever in heaven, and what Paul wrote is merely an accurate reflection thereof, penned under special guidance of the Deity itself. Wow, you do have a very persuasive argument style. Very confident. To the point. Congratulations. St. Anne be with her. No, ἄρτος is used only by way of analogy for unleavened bread. The term ἄζυμος is quite common in the OT LXX, as is the Feast of Unleavened [Bread] ἑορτῇ τῶν ἀζύμων,(Bread is in brackets because it is not in the Greek), which became such a techinical term (like ἐπίσκοπος) that it was adopted straight into Latin (like episcopus) and passed (like >bishop) into English:Azymes (used in the Douay-Rheims). Because of the technicalities involved in Passover Mazzot, it is quite rare if not unknown to use the default word for "bread" in such a context. It is as technical as mazzas/mazzot are in English. It would be as odd to refer to them as ἄρτος as to talk about bread during Passover: ἄρτος/bread is precisely what you are not supposed to be eating. Deut. 16:3 3 You shall not eat with it leavened bread: seven days shall you eat without leaven, the bread of affliction" is often cited for support of this loose terminology, but the Greek reads 3 οὐ φάγῃ ἐπ' αὐτοῦ ζύμην ἑπτὰ ἡμέρας φάγῃ ἐπ' αὐτοῦ ἄζυμα ἄρτον κακώσεως "unleavened [bread], the Bread of Afflication," i.e. a rather ironic apposition of sorts in the use of ἄρτος. Bread is in brackets, because it does not appear in the Greek. Judges 6:20 "And the angel of the Lord said to him: Take the flesh and the unleavened loaves, and lay them upon that rock, and pour out the broth thereon. And when he had done so." is also used as proof. But the Greek reads ἄρτους τοὺς ἀζύμους, and then in the next verse (where English has "unleavened loaves," and Latin "panes azymos" and the bizarre "carnes azymosque panes") Greek has just ἀζύμους. This would be an unusual reference to unleavened bread being in loaves as instead of cakes, and indeed the LXX varient in verse 20 is ἄζυμα. The showbread are also cited as an example, but the Scripture does not state that they were unleavened. Eating the Passover is a common expression in Hebrew and Aramaic (appearing only once, in II Esdars 6:21, in the LXX), but no expression "Eating the Mazzoth" appears for Passover. Again, it is determinative that no lamb (except of course, THE Lamb of God) is in the synoptics. Which is a problem, because ἄρτος is the word without exception used in reference to the Mystical Supper, although bare ἄρτος is never used in reference to the Passover, nor the mazzoth. Btw, the Latin defense has depended on a twisting of St. Jerome's mistranslation. The NT text says "A little leaven leavens the whole loaf." The Vulgate reads "corrupts the whole loaf," which makes little sense since St. Paul is telling us to be the new leaven of Christ. As the Theological Dictionary above shows, the Synoptics (the one with the date problem) portray leaven "as a kind of dynamis which, although present in only a small measure (restricted to Jesus and His followers or to Jesus Himself and His small sphere of possible operation) is ordained and able to penetrate the whole world. We must look to the other element in the Eucharist. Namely the wine which also needs yeast to ferment. It's important to keep in mind how the Passover Seder within Judaism is celebrated today is not necessarily how Passover Seder was celebrated at the time of Christ. There really isn't much documented information about the "order" of the Seder until Talmudic times, and in fact what is documented from 2nd temple Judaism often times seems to contradict Rabbinic Judaism's celebration of it. By that I mean the "order", liturgically speaking, not it's over all theme, tradition, or meaning behind it which has remained the same. But the details. So trying to draw theology by looking at Jesus celebrating a Seder, then trying to plug that meal into a 5th century model is a horrible, horrible mistake, historically speaking. So while Rabbinic Judaism gives us a very good starting point, it's a big, big mistake to assume 5th century Judaism was the same thing as the Judaism of Jesus day, particularly in practice. Judaism was not a monolithic block, and there is in fact archaeological evidence suggesting Judaism used multiple calendars in the 1st century, so Passover could have fallen for different groups of Jews on different days. (usually within one or two days difference) I think I had once read the Essenes used a different calendar (solar? . . .maybe Ialmisry can give some insight on that?) to determine passover, or at least that is scholarly speculation. The truth is this is not a new debate, and goes way, way back to the early Church. it's been discussed by scholars, ancient, and modern, historians, secular and religious, and everyone in between. And I think the true answer to "was the last supper a Seder?" is we really do not know. As for Protestant opinions, some of the best NT scholars in the field are Protestant, and many of them say "we don't know"....as do many preachers, and ministers within Protestantism. When I was a protestant I was taught both sides at different stages. In some circles it's strongly favored that it was NOT a Passover Seder, and that Jesus died while the Passover lambs were being slaughtered, thus Jesus IS the Passover lamb. the imagery is obviously powerful, and of course is basically the position of the Eastern Church. But other Protestants believe it indeed was a Passover Seder, which invokes it's own imagery. However i've always found that idea odd, that on the first day of Passover Jews were out trying to get Jesus crucified, and in fact were watching Him and taunting Him, in the first day of Passover. That never made much sense to me. But that's my personal bias. I guess you should ask yourself what you are seeking. Which is more historically accurate? (ie: what happened in real history) Or are you asking what you "want" to be true based on long standing traditions of your particular Church? The historical question, most scholars contend has no definitive answer as of yet. There is so much conflicting evidence on this subject in the Gospels, and on many subjects in fact, that since very early on, Christians have always tried to "harmonize" the Gospels, and it always comes up short. This shouldn't destroy anyone's faith, anymore than finding out Matthew the apostle probably didn't write the Gospel of Matthew.....however it still stands firmly in that specific tradition, just like John's gospel does. Maybe some day they'll dig up more evidence to give definitive evidence but historically speaking I don't think there is any way to know for sure, at least not yet. I'lll post St. John Chrysostom sermon on the passage, which is rather interesting and of course on point, when I get back. Fatherhood calls. IMHO your interpretation of Paul is corrupt and way off the mark and you arrogantly refuse to even entertain the possibility that others (for example, the mind of a Church that claims a 2,000 year continuous history) might be correct and you might be wrong. We have offered our thoughts here and you simply continue with the intellectual and spiritual equivalent of covering your ears and yelling LALALALALALALALALALALA I CAN'T HEAR YOU, I CAN"T HEAR YOU!!!! I bear you no ill will, but I frankly see little point in continuing to discuss this matter with you. St. John speaks of this, as we'll see in shaa' Allaah! How many do you have? Age? Icon depicting St. Paul inspiring St. John Chrysostom's commentaries of his Epistles. It is worth noting that St. John's ear in which St. Paul spoke to him is still incorrupt to this day, and is visible on his Sacred Head. Wrong my friend...you are unfortunately speaking for yourself since the COE (my church) which descends from the very first people who accepted the Gospel say you are- As do the records, the interpretative history of the NT, and what my Greek compatriots here at the Orthodox forum testify for. The Aramaic which Jesus spoke testifies that the bread he used was leavened, as does the Greek. The use of unleavened bread is unscriptural and an addition. So is this business of the Eucharist being "symbolic". I'll trust the patriarchs of my church over John Hagee or Ted Haggard. According to St. John Chrysostom, by his own hand, dictated as it were by St. Paul, under inspiration by God and preserved in the Holy Writ and Apostolic Tradition of Holy Mother Church of the living God the pillar and ground of the Truth (1 Timothy 3:15). It is actually reported that there is fornication among you, and such fornication as is not even named among the Gentiles, that one of you hath his father’s wife. And ye are puffed up, and did not rather mourn, that he that had done this deed might be taken away from among you. As I have pointed out, the section is on fornication, not rubrics. Even heresy as spiritual fornication is not the topic, as the contrast St. John makes here between this and where St. Paul speaks of schism/heresy. The emphasis on the Church as a body, the Body, however is and will be key to the understanding of the passage. And he said not, “Fornication is perpetrated,” but, “Is reported,—such as is not even named among the Gentiles.” For so continually he makes the Gentiles a topic of reproach to the believers. Thus writing to the Thessalonians, he said, (1 Thess. iv. 4, 5,) “Let every one possess himself of his own vessel in sanctification, not in the passion of lust, even as the rest of the Gentiles.” And to the Colossians and Ephesians, (Ephes. iv. 17. cf. Col. iii. 6, 7.) “That you should no longer walk, as the other Gentiles walk.” Now if their committing the same sins was unpardonable, when they even outdid the Gentiles, what place can we find for them? tell me: “inasmuch as among the Gentiles,” so he speaks, “not only they dare no such thing, but they do not even give it a name. Do you see to what point he aggravated his charge? For when they are convicted of inventing such modes of uncleanness as the unbelievers, so far from venturing on them, do not even know of, the sin must be exceeding great, beyond all words. And the clause, “among you,” is spoken also emphatically; that is, “Among you, the faithful, who have been favored with so high mysteries, the partakers of secrets, the guests invited to heaven.” Dost thou mark with what indignant feeling his works overflow? with what anger against all? For had it not been for the great wrath of which he was full, had he not been setting himself against them all, he would have spoken thus: “Having heard that such and such a person hath committed fornication, I charge you to punish him.” But as it is he doth not so; he rather challenges all at once. And indeed, if they had written first, this is what he probably would have said. Since however so far from writing, they had even thrown the fault into the shade, on this account he orders his discourse more vehemently. Again, the emphasis of all, although a specific few are meant, because all are implicated. [2.] “That one of you should have his father’s wife.” Wherefore said he not, “That he should abuse his father’s wife?” The extreme foulness of the deed caused him to shrink. He hurries by it accordingly, with a sort of scrupulousness as though it had been explicitly mentioned before. And hereby again he aggravates the charge, implying that such things are ventured on among them as even to speak plainly of was intolerable for Paul. Wherefore also, as he goes on, he uses the same mode of speech, saying, “Him who hath so done this thing:” and is again ashamed and blushes to speak out; which also we are wont to do in regard of matters extremely disgraceful. And he said not, “his step-mother,” but, “his father’s wife;” so as to strike much more severely. For when the mere terms are sufficient to convey the charge, he proceeds with them simply, adding nothing. And “tell me not,” saith he, “that the fornicator is but one: the charge hath become common to all.” Wherefore at once he added, “and ye are puffed up:” he said not, “with the sin;” for this would imply want of all reason: but with the doctrine you have heard from that person. Here we come to the nexus of what the passage is about, and what misuse it has been put, as we will see. This however he set not down himself, but left it undetermined, that he might inflict a heavier blow. And mark the good sense of Paul. Having first overthrown the wisdom from without, and signified that it is nothing by itself although no sin were associated with it; then and not till then he discourses about the sin also. For if by way of comparison with the fornicator who perhaps was some wise one, he had maintained the greatness of his own spiritual gift; he had done no great thing: but even when unattended with sin to take down the heathen wisdom and demonstrate it to be nothing, this was indicating its extreme worthlessness indeed. Wherefore first, as I said, having made the comparison, he afterwards mentions the man’s sin also. Again, the implication of the whole by part of it. Of course that treatment is possible when a limb can be cut off, but when, say, cancer is spread throughout, like say yeast in a lump of dough, what can be done? Hence St. John (and St. Paul)'s line of argument here: one for all and all for one. I'm going to break St. John's sermon up, as to make commenting easier. 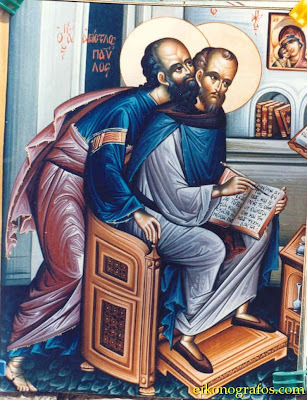 At this point St. Paul (and St. John) turns to the theme of teaching, which is common to what he is actually talking about, and the words being put in his mouth by the azymites. 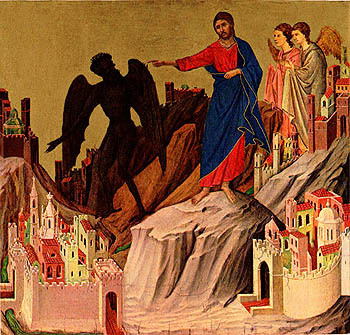 That icon of Christ tempted by Satan looks amazing. Do you know the author Isa? you mean with the old leaven of Judaism, which we haven't gotten to yet (step-sonship called this time): Behold, I Paul say unto you, that if ye eat azymes, Christ shall profit you nothing. For I testify again to every man that eats azymes, that he is a debtor to do the whole law. Christ is become of no effect unto you, whosoever of you are justified by the law; ye are fallen from grace. For we through the Spirit wait for the hope of righteousness by faith. Such is the corporate nature of the Body of Christ: the episcopacy provides the spine attached to her Head Christ, but the other members are attached and invovled. Hence the power of the least bit of leaven, good or bad, the leaven of Christ or the leaven Satan tries to introduce into the lump. Some, however, read thus, “Him that hath so wrought this thing in the name of our Lord Jesus Christ,” and putting a stop there or a break, then subjoin what follows, saying, “When you are gathered together and my spirit to deliver such an one unto Satan:” and they assert that the sense of this reading is as follows, “Him that hath done this thing in the Name of Christ,” saith St. Paul, “deliver ye unto Satan;” that is, “him that hath done insult unto the Name of Christ, him that, after he had become a believer and was called after that appellation, hath dared to do such things, deliver ye unto Satan.” But to me the former exposition appears the truer. Both readings of St. Paul claim to stick with St. Paul? Which is correct, if it is a matter of black and white dogma? The proof is in what leaven was put in the loaf, that of the Apostles or that of the Pharisees: beware the leaven of the Pharisees, Sadducees and Herod. “For the destruction of the flesh.” As was done in the case of the blessed Job, but not upon the same ground. For in that case it was for brighter crowns, but here for loosing of sins; that he might scourge him with a grievous sore or some other disease. True it is that elsewhere he saith, “Of the Lord are we judged, (1 Cor. xi. 32.) when we suffer these things.” But here, desirous of making them feel it more severely, he “delivereth up unto Satan.” And so this too which God had determined ensued, that the man’s flesh was chastised. For because inordinate eating and carnal luxuriousness are the parents of desires, it is the flesh which he chastises. St. Paul next turns to the heart of your argument, I'll pick it up there, in shaa' Allaah. I think, for me, it's been reasonably shown that the Sacred Texts depicts Our Lord's Last Supper with some ambiguity. I also recognize that the Mind of the Church is forward looking... into eternity and not backward to what is past and fulfilled. I believe if you hold to such a view, the only what to look at the Eucharist is as a foretaste of that Heavenly Banquet with Our Lord and not as a Jewish Seder. I guess we have to ask ourselves are with reenacting the past or enacting eternity? Speaking about the future, what about the baby? Weren't you just arguing against iconography as a member of the ACE a few weeks ago? Did you have some change of heart, or did I misunderstand your position? Congratulations to you both, Ignatius. I suppose I should add something uniquely Roman Catholic to all of this. I was looking over differences between the old Vulgate and the Stuttgart and discovered that the Vulgate and Old Latin readings of the words of institution often read "effundetur" and "fundeter" (will be poured out) as opposed to "effunditur" and "funditer". If you attend a Roman Catholic mass (or a strictly translated WRO service), you will also hear "will be poured out" during the words of institution. In the Clementine Vulgate, this is in both Corinthians and the Synoptics, and both versions can be found in ancient Latin witnesses. The old witnesses sometimes read one way in Mt and another in Mk. Thus the Marcan account in Codex Vercellensis reads "effundetur" where the Matthaean account reads "effunditur" (As a "Western non-interpolation, there is no second cup reading in Luke). This is obviously a very old Latin church thing. It was the liturgical understanding of the Western Church that the actual pouring out of his blood that Jesus' was referring to at the Last Supper... was Calvary, and that this was reflected in both the Mass and its Latin New Testament. I stumbled on a paper from a scholar who was not happy that, in the past 40 years, this was corrected to read "is poured out," in both Weber's Stuttgart Vulgate and the new version. The paper cited linguistics as well as ancient patristic witnesses (St. Jerome, and Coptic translations?!? ), and old Vulgates defending the translation choice, and also spent a bit of time defending the Johannine account of the Last Supper taking place BEFORE Passover. I mentioned this very old Latin Church thing to the editor of the EOB New Testament and he seemed intrigued, at what looks, on the surface, to be a mistranslation of the Greek, and yet is more than that. If your understanding is that Liturgy reflects theology, then there is something here that was being said. That in Latin theology, the Last Supper - and the institution of the Eucharist - points to Calvary.